One of the biggest canoeing races in the annual build-up to the FNB Dusi Canoe Marathon pays tribute to Ozzie Gladwin, a stalwart of the sport in the 1960s, who strangely, was never a paddler himself. Ozzie Gladwin got involved in the sport supporting his son Peter Gladwin, who was a successful doubles paddler in the early days of the Dusi, winning the K2 title in 1959 with Dave Sterling, and again with Derek Antrobus in 1963 and 1964. Peter Gladwin married Fletcher Campbell’s daughter, which gradually drew Ozzie Gladwin closer to the canoeing community. Ozzie Gladwin was a respected time keeper at the Roy Hesketh race track in Pietermaritzburg, and was tasked with bringing his timekeeping and administrative experience to canoeing, and he quickly became a regular feature at all the domestic races run by the provincial canoeing union. With the local season leading inextricably to the annual Dusi Marathon from Pietermaritzburg to Durban, Gladwin was closely involved with the organising and running of the race in the sixties. He added another string to his bow when he used his amateur radio ham experience to try and solve the perennial problem of a lack of communication once the race got deep into the Valley of a Thousand Hills. Demand for information on what was happening in the Dusi every year, particularly from the newspapers and the SABC Radio stations, led Gladwin to fitting a radio unit to his Willy’s Jeep, and thereby enabling updates on the race’s progress to be transmitted out of the valley for the first time. Gladwin set up a network of fellow radio ham operators along the route to whom he would communicate updates on the races, which were then telephoned to the newspapers and radio stations. “He was a very amiable man, everyone liked him,” recalls his son Peter. “He took the timekeeping job very seriously, and was also a fantastic supporter and second to me and my partners over the years. 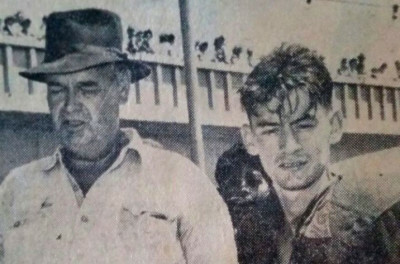 Peter Gladwin enjoys recalling the pioneering days of his racing and his father Ozzie’s involvement as an official. While the advances in technology gradually replaced Ozzie Gladwin’s communication solution, he is remembered as a loyal servant of the sport, and the Ozzie Gladwin Canoe Marathon that is held from Albert Falls dam to Thornvale Farm on the Upper uMngeni every year, pays tribute to his contribution to the sport. The 2017 Ozzie Gladwin Canoe Marathon takes place from Albert Falls Dam to Thornvale Farm on Sunday 26 November.